Yabangee’s “Expat Spotlight” will focus on “new media” this month. Delve into the experience of Istanbul's expats in new media, learn how to incorporate technological tools into language teaching or listen to esteemed figures discuss utilizing technology to build futures for refugees. 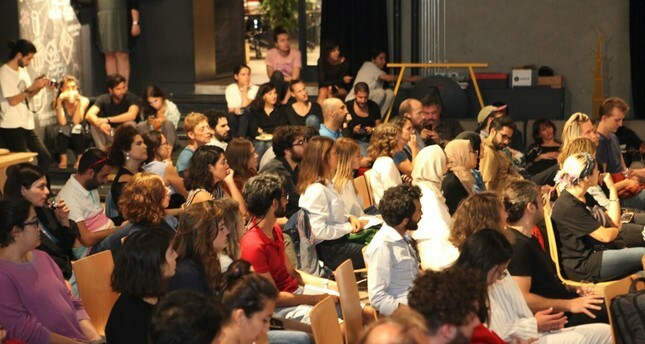 Every month there is a talk series that showcases the contributions made by the diverse international community in Istanbul in a wide variety of spheres that is held at ATÖLYE, a multidisciplinary creative hub and innovative design studio, located in the historical beer factory-turned entertainment complex, bomontiada. Titled "Expat Spotlight," this monthly talk series is organized by Yabangee, a volunteer-run informative website, platform and community for foreign residents in Turkey. Every month, there is a different focus, with this month's topic being the contemporary theme of "New Media," and half a dozen or so expats are invited to share their own personal experiences and participate in resourceful dialogue. This month's Expat Spotlight, which is also its 16th edition, will take place on Tuesday, Nov. 27 at 7:30 p.m. with doors opening half an hour earlier. This event is free for foreigners and locals alike, and there is no need to reserve a spot. The master of ceremonies for the evening will be Jamie Leptien, a freelance writer from Cork, Ireland. He writes about emerging economies for Oxford Business Group and has a feature on the work of British-born artist Navine G. Khan-Dossos in the current issue of Cornucopia Magazine. The guest speakers at this week's Expat Spotlight will be photojournalist and multimedia storyteller Tara Todras-Whitehill, who is the co-founder of Vignette Interactive, an innovative storytelling company. Hailing from the U.S. and based in Istanbul, Todras-Whitehill has been involved in the Middle East for 12 years now such as serving as a staff photographer with The Associated Press to capture the 2011 revolutions in Egypt and Libya. She has worked with a number of prestigious publications including receiving a World Press Photo award for her work in Sierra Leone with the New York Times. With Vignette she creates multimedia projects for nongovernmental organizations such as UNICEF, Amnesty International and the International Rescue Committee and has received grants from the European Journalism Centre to create global stories about women's access to abortion. Check out her creative online storytelling company at www.vignette.global. Zofia Goss is a New Media Arts graduate from Poland, who also specializes in animation. She has developed her own brand as an artist on zofiagoss.com from where she works in a variety of fields in new media arts, from video mapping and animation to branding and corporate design, photography and painting. Every Saturday over the next month the International Training Institute (ITI) will be offering a special course to share methods of utilizing technology in their language teaching courses. Participants will learn how to use a wide range of applications and programs to incorporate into their teaching such as teaching macro skills using technology as well as utilizing a variety of G-suite apps, including Google apps, software, products and tools for cloud computing, productivity and collaboration in learning. Run by Tom Godfrey, whom you may know as the founder of Speech Bubbles, the English-language theater troupe and school, ITI has been the definitive center for English-language teaching candidates to receive internationally recognized CELTA and DELTA certificates. The innovative technology course will be taking place over the next four Saturdays from 2 p.m. to 5 p.m. The 9th Bosporus Summit will be taking place from Nov. 26 to 28 at the Four Seasons Hotel and will center on the theme of "Sustaining Peace and Development for All." Held under the auspices of the Republic of Turkey and by the International Cooperation Platform (UIP), there will be nearly 200 influential speakers taking part in panel discussions for an audience of state officials, leading business figures and civil society organizations. "Technology: Building Futures for Refugees" is one of the many topics that will be discussed in panels held throughout the summit, which will also include "The International Gas Trade and Its Demands, Megaprojects and New Development Banks, Trade with Local Currency from the Perspective of Bankers and Exporters, and Global Threat to Development for All: Trade Wars." This particular panel is being organized by the Maya Foundation, which works closely with refugees by providing social, psychological and educational support. Trade and Technology Minister Mustafa Varank will be giving the keynote address. Maya founder and Chairwoman Esra Özsüer will be giving the opening speech and the moderator will be Thomson Reuters Foundation Middle East Rapporteur Heba Kanso. Participants include Hawksford EU Growth Director Danny Curran, Robotel founder Zeynep Karagöz, Panasonic Strategy Director Hakan Kostepen, UNHCR Turkey Country Director Katharina Lumpp, Na founder Takallam Aline Sara and Markus Schwertel, lead for government relations Central and Eastern Europe, the Middle East and Africa at HP.